Shop for aluminum gantry cranes at Material Handling Solutions. Aluminum gantry cranes are ideal for use when constant assembly & disassembly is necessary. These cranes can be moved from job site to job site and provides a safe way for one person to lift heavy equipment alone. 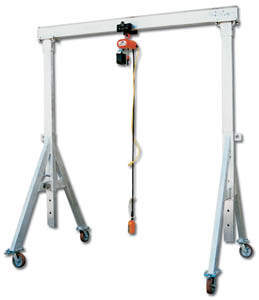 Aluminum gantry cranes are lightweight, portable and easy to assemble and knockdown again. They are available in capacities from 1 ton gantry cranes to 2 ton gantry cranes, have adjustable I-beams for infinite span settings and adjustable height uprights. 3,4 & 5 ton aluminum gantry cranes are available upon request. We can make you a custom aluminum gantry crane at no additional charge. Manual & Electric Hoists and trolleys are available. We are a large distributor of material handling equipment, industrial supplies, office furniture, office supplies, and office electronics.